What is Pearl Couscous? Pearl Couscous is not the traditional couscous associated with North African cuisine. North African Couscous is a Berber preparation that consists of very small (1 mm) granules of semolina wheat which are coated in wheat flour. Pearl Couscous, also known as Israeli Couscous (or ptitim) is made of baked wheat rather than semolina, and is similar to pasta. Its granules are much larger in size and maintain their individual texture and firmness without sticking, which makes it a great candidate for salads and a substitute for orzo and rice. Pearl couscous may be toasted before simmering in liquid, which will impart a lovely golden hue and flavor that will hold up against spices and herbs. This salad is delicious as is or as an accompaniment to grilled meat, chicken or fish. It’s spicy, crunchy and fresh. Tiny pearl couscous are tumbled with a variety of sweet and hot peppers, and freshened with crisp parsley, mint and cilantro leaves. 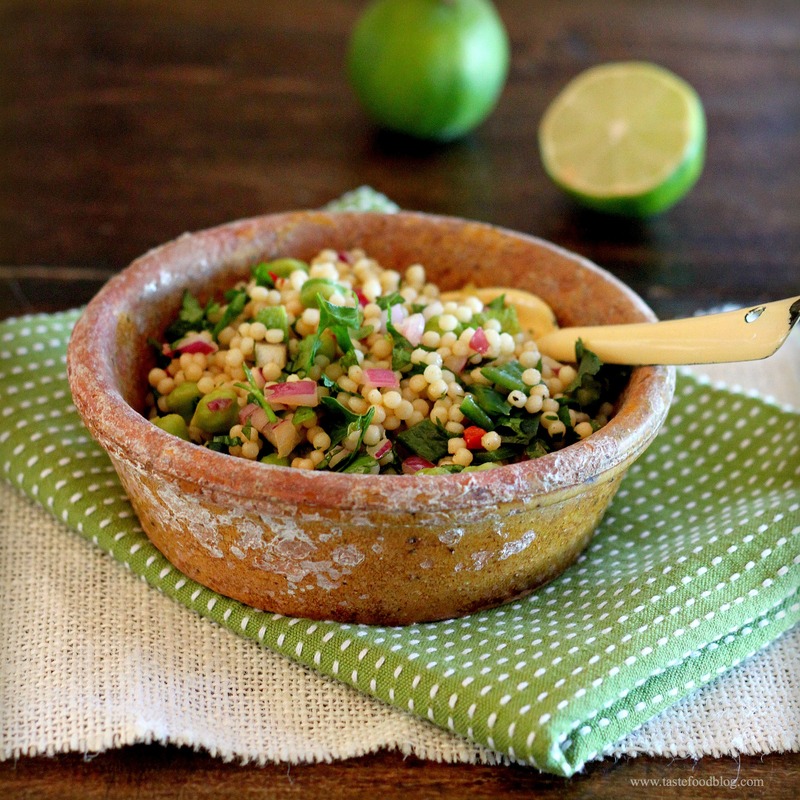 Call it a salad, side dish or light meal, Pearl Couscous Salad is addictively good. If you prefer a vegetarian option, substitute the chicken stock with water and crumble feta cheese over the salad before serving. Feel free to add other ingredients such as cherry tomatoes, grated carrot or lightly sauteed zucchini or broccoli. There is no single way to prepare this dish allowing you to be creative and resourceful with your refrigerator ingredients. Heat one tablespoon olive oil in skillet. Add couscous and cook, stirring, until couscous is golden brown, about 3 minutes. Add chicken stock. Bring to a boil, reduce heat and cover. Simmer until liquid is absorbed and couscous is tender but firm, 10 minutes. Remove from heat and transfer couscous to a large bowl, fluffing with a fork. Stir in one tablespoon olive oil, lemon juice, salt, pepper, cumin and cayenne. Set aside to cool. When cool, add remaining ingredients and toss to combine. Adjust seasonings to taste. Serve at room temperature. Note: If you are preparing the salad in advance, do not add the parsley, mint or cilantro until serving to prevent wilting. Hi Linda: I love your blog and your photography. You make the exactly the kind of food I want to eat immediately (if not sooner)!! So glad I discovered your blog. Happy New Year!! That is a gorgeous and very appetizing photo! It’s a nice change of pace from all of the heavy foods we’ve had over the holidays. Thank you for your comments! This is a perfect dish to begin the new year. Happy 2010! I find the name of this salad so new. I think I haven’t tried this before but it looks so delicious! This recipe absolutely rocks, Lynda. It will definitely be a stable at our house and it is perfect for potlucks as well. Am trying the same salad tonight using quinoa as I ran out of Israeli couscous. Will let you know how it works out. Had tasted this kind of salad at friends house. Tried this recipe with few changes last night and it was an instant hit.! Thank you. The Hebrew name for this is not “pitim” but “ptitim”!